I’m not a resolution kind of guy, but since the beginning of the year, I decided to lean more toward a plant-based diet. And it helped, of course, that Steve and Joanne (my in-laws) bought Scott Jurek’s book Eat and Run for me for Christmas. Scott’s an ultra runner whose been a vegan since 1999. Runners require substantially more protein than non-runners, so it’s interesting (and easy) to learn that getting protein from plants isn’t as hard as it seems. I’m not committing to going full-on vegetarian or vegan, but consciously trying more plant-based meals will help me & the family get the vegetables that we should be eating anyway. I was a humanities major, so my math isn’t great, but I think 95% of my meals this past week were either vegan or vegetarian. On Wednesday, I went to lunch with my friend Brant and had a salmon filet with roasted sweet potatoes and broccoli at Whole Foods. Elise cooked bacon last week for breakfast and for a New Years black-eyed pea soup, and I ate a piece of bacon. Beyond that, I seriously don’t think I’ve eaten any meat this week. I’ve had dairy in the form of yogurt and sour cream, but no cheese. Two recipes that I’ve made this past week turned out damn good, and did NOT leave me thinking, “this would’ve been better with beef or pork.” Last Sunday I made tempeh tacos. Tempeh is fermented soy beans that’s high in protein and comes in a pressed loaf form. You just cut it into whatever size chunks you want, season it and sautee it. Well, that’s all I’ve done with it thus far. I’m are there are a lot of different ways to prepare tempeh. I made my tacos like I’d probably make any other tacos. I sauted the tempeh with garlic, salt, pepper, chile powder and cumin. I served it with grilled onion, guacamole, sour cream, cilantro and jalapeÃ±os on mixed flour & corn tortillas. I’d eat the hell out of these tacos all day long. On Wednesday night I cooked curried tofu. Tofu (and tempeh) are awesome because they’re both like neutral, flavorless sponges, just waiting to absorb whatever flavors you add to them. Instead of frying the tofu, I “heavily sautÃ©d” them, a fancy culinary term I learned from Jeff Blank that basically means I fried them. And then I sautÃ©ed yellow onions and garlic with a bunch of chile powder, cumin, ground coriander, cardamom turmeric and garam masala. Then I added some diced tomato (from a can) and heavy cream. That was so amazing that I made a second pan of the same recipe and added cauliflower. Last night Elise made a Sriracha stir fry with every vegetable in our fridge with some flax seed tempeh and baby bella mushrooms. And that was awesome and spicy. And yesterday my copy of Thug Kitchen showed up in the mail. 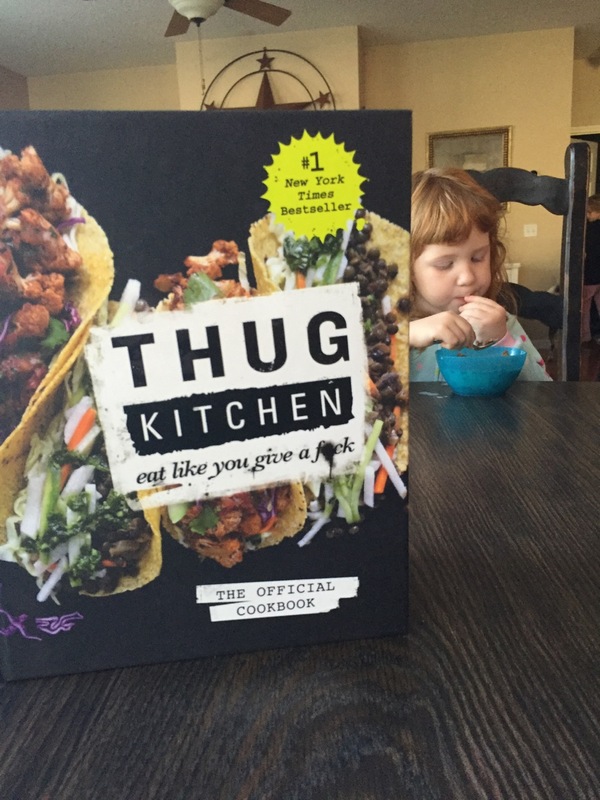 Thug Kitchen is a vegan cookbook. Don’t get me wrong, I’ll probably still smoke briskets and pork butts on occasion, but we’ll probably be eating a lot of really good plant-based food in between.